Electric dominance of the brain working is well confirmed and established by health and neural sciences. Electric signals within the brain not only govern/control the working of the human body, but according to recent medical studies, these signals with suitable electric brain stimulation techniques can be controlled to enhance the desired activities of the human body like motion, memory, health, peace and more. This article aims to bring to the reader such useful outcomes of electric brain stimulation, but with caution that such technology should be used under proper medical expert supervision. Electric brain stimulation in its current form may be relatively new, but humans have been tinkering with the brain for centuries. Electrical brain stimulation, also referred to as focal brain stimulation (FBS), is a form of electrotherapy. This technique is used in research and clinical neurobiology to stimulate a neuron or neural network in the brain through direct or indirect excitation of its cell membrane by using an electric current. Electrical brain stimulation was first used in the first half of the 19th century by pioneering researchers such as Luigi Rolando (1773 – 1831) and Pierre Flourens (1794 – 1867), to study the brain localisation of function, following the discovery by Italian physician Luigi Galvani (1737 – 1798) that nerves and muscles were electrically excitable. In the following century, the technique was improved upon by the invention of the stereotactic method by British neurosurgeon pioneer Victor Horsley (1857 – 1916) and by the development of chronic electrode implants by Swiss neurophysiologist Walter Rudolf Hess (1881 – 1973), José Delgado (1915 – 2011) and others, by using electrodes manufactured by straight insulated wires that could be inserted deep into the brain. Two-photon excitation microscopy has shown that micro-stimulation activates neurons sparsely around the electrode even at low currents (as low as 10µA), up to distances as far as 4mm away. This happens without particularly selecting other neurons much nearer the electrode’s tip. This is due to activation of neurons being determined by whether these have axons or dendrites that pass within a radius of 15µm near the tip of the electrode. As current is increased, volume around the tip that activates neuron axons and dendrites increases and, with this, the number of neurons that are activated. Activation is most likely to be due to direct depolarisation rather than synaptic activation. Medical experts and companies have developed a variety of non-invasive brain stimulation technologies such as cranial electrotherapy stimulation (CES), deep brain stimulation (DBS), transcranial direct current stimulation (tDCS), electroconvulsive therapy (ECT), functional electrical stimulation (FES), magnetic seizure therapy (MST), vagus nerve stimulation (VNS) and deep transcranial magnetic stimulation (deep TMS). tDCS is getting loads of attention from early adopters who rave about its potential, and scientists who are trying to unravel what it can and cannot do. It is a non-invasive form of brain stimulation that involves passing a current between electrodes on the scalp. The technique is one of a number of technologies being tested to see if it can enhance cognitive functions such as boosting the performance of drone pilots or image analysts. According to the experts, the current is set to about 2mA, which is about 1000 times less than the electrical current that flows through a typical iPad charger, and only about 1/50th of that current makes it through the skull to the brain. The stimulation is said to last for about ten minutes, and is aimed at the right inferior frontal cortex and the right anterior temporal lobe, which are brain areas thought to be important for learning. A mild stinging sensation is felt where the electrode is attached to the head. This is thought to be a normal feeling, but if the sensation continues, it is better to turn off the connection and try to get a better connection. Next, people notice a slight taste of metal in their mouth, a common side effect of tDCS, according to experts. Although this is an experimental method, it is widely regarded as safe and does not appear to cause any short-term harm. The most common side effects of stimulation include tingling or skin irritation and seeing phosphenes (light rings or spots not produced by actual light). Other side effects include fatigue, headache and itching under the electrode. In rare cases, people experience nausea or insomnia. Some studies have found impressive gains in performance from tDCS, while others suggest the technique has little effect. That has not stopped adventurous amateurs from testing home-made devices on themselves, though this is not recommended. Scientists are still investigating how tDCS works, but the reigning hypothesis is that it changes the excitability of a particular brain region. Depending on the direction of the current, stimulation could make neurons in a particular area of the brain more or less likely to fire. Recent studies have focused on using tDCS to boost the performance of image analysts for the military. The study found that participants who received training and stimulation were about 25 per cent more accurate in identifying the objects than those without stimulation. Some studies claim to have found benefits in everything from mental arithmetic to memory; other studies have found no evidence of cognitive effects from a single session of tDCS. Research on tDCS is not limited to seeking cognitive boosts. Many scientists are also investigating its efficacy in treating mental disorders such as traumatic brain injury and schizophrenia. However, there is no administrative approval for the use of the technique. Similarly, TMS uses a magnetic coil to induce small electrical currents in the brain. In contrast to tDCS, TMS actually causes neurons to send signals or spike, and it has been approved for treating depression and migraines. Focused thinking, better memory, deeper sleep, relief from depression and reduced stress are some benefits of electronic stimulation for the mind and brain as mentioned in the literature on the Internet by companies dealing with the development of different types of the brain stimulation devices. Popular electric brain stimulation methods that are used to boost brainpower are detrimental to IQ scores. Using a weak electric current in an attempt to boost brainpower or treat conditions has become popular among scientists and do-it-yourselfers, but a new study shows that using the most common form of electric brain stimulation has a statistically significant detrimental effect on IQ scores. Strong electric currents may cause a localised lesion in the nervous tissue instead of a functional reversible stimulation. This property has been used for neurosurgical procedures in a variety of treatments such as for Parkinson’s disease, focal epilepsy and psychosurgery. Sometimes, the same electrode is used to probe the brain for finding defective functions, before passing the lessoning current (electro-coagulation). Cognitive. Acalculia, paraphasia, anomic aphasia, recalling memories, going into a trance, out-of-this-world experience, conduction aphasia, hemispatial neglect, reliving past experiences, agraphia, apraxia and so on. Electrical stimulation of the brain is a relatively new technique used to treat chronic pain and tremors associated with Parkinson’s disease. It is administered by passing an electrical current through an electrode implanted in the brain. 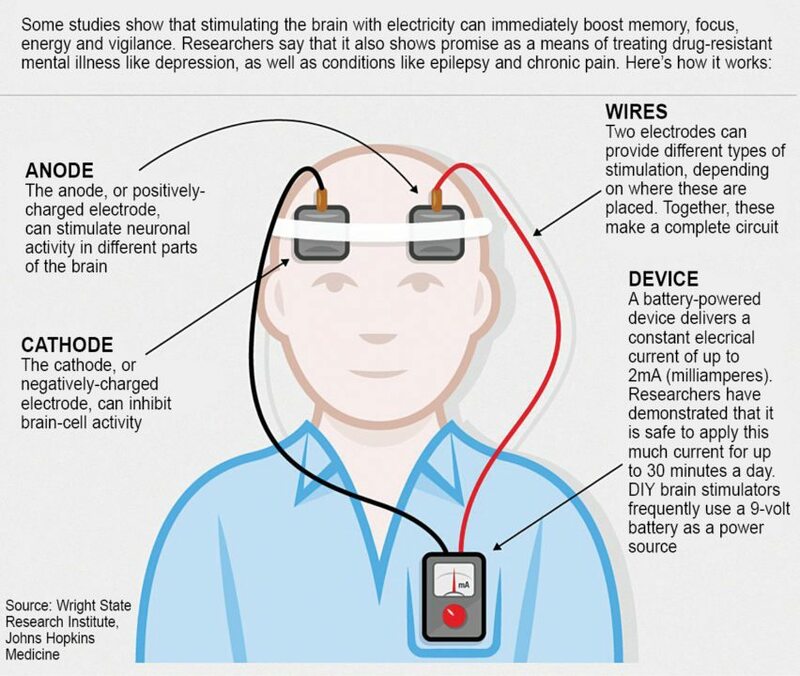 While implantation of electrodes in the brain is used to treat or diagnose several disorders, the term electric brain stimulation is limited to the treatment of tremors and as a pain-management tool for patients suffering from back problems and other chronic injuries and illnesses. An electric brain stimulation tremor-control device used in treating people suffering from Parkinson’s may interfere with or be affected by cardiac pacemakers and other medical equipment. As a result, patients with other implanted medical equipment may not be good candidates for the therapy. Electrical stimulation of the brain, or deep brain stimulation, is effective in treating tremors in up to 88 per cent of Parkinson’s disease patients. An electrode is implanted into the thalamus (part of the brain) of the patient and is attached to an electric pulse generator via an extension wire. The pulse generator is implanted into the patient’s pectoral, or chest area, and the extension wire is tunneled under the skin. The pulse generator sends out intermittent electrical stimulation to the electrode in the thalamus, which inhibits or partially relieves the tremor. The generator can be turned on and off with a magnet, and needs to be replaced every three to five years. Similar methods have been used to treat chronic pain that responded unfavourably to conventional therapies. A remote transmitter allowed these patients to trigger electric stimulation to relieve their symptoms on an as-needed basis. Patients with failed back syndrome, trigeminal neuropathy (pertaining to the fifth cranial nerve) and peripheral neuropathy fared well for pain control with this treatment, while patients with spinal cord injury and postherpetic neuralagia (pain along the nerves following herpes) did poorly. Implantation of electrodes into the brain carries risks of hemorrhage, infarction, infection and cerebral edema. These complications could cause irreversible neurological damage. Patients with an implanted electric brain stimulation tremor-control device may experience headaches, disequilibrium (disturbance of the sense of balance), burning or tingling of skin or partial paralysis. Preliminary research on the effects of tDCS has spurred a host of scientists (and amateurs) to explore the possibility of improving cognitive function, increasing reaction times and treating mental illnesses through carefully-applied electrodes. 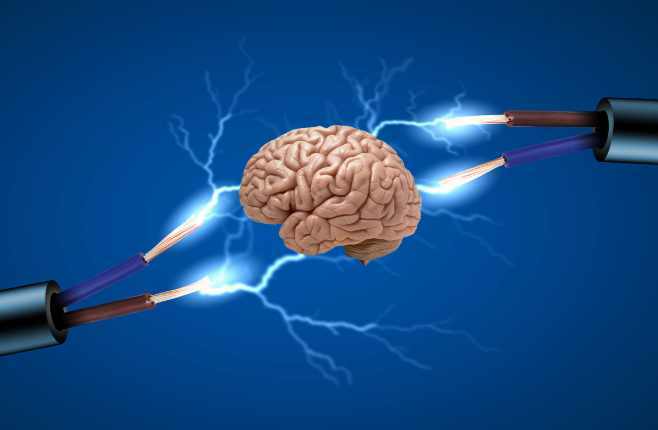 Research has shown that by delivering electricity to the right part of the brain, we can change the threshold of neurons that transmit information in our brain and, by doing that, we can improve cognitive abilities in different types of psychological functions. The idea is to make the neurons more likely to fire. Preliminary research suggests that electrical stimulation can improve attention as well as have a positive impact on people with cognitive impairments and depression. 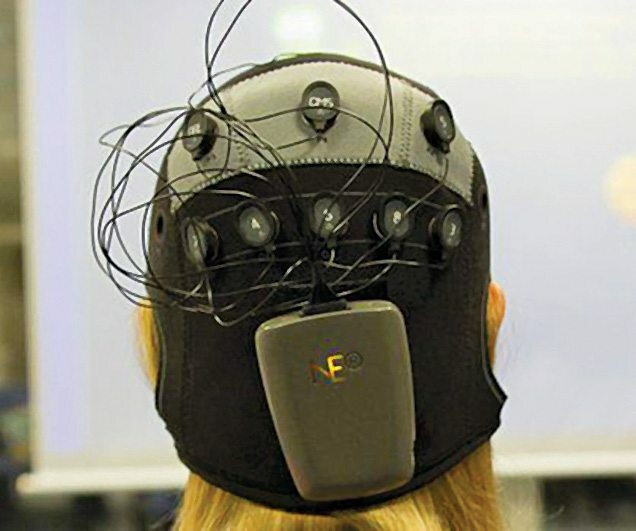 Research has also highlighted that electrical brain stimulation could have favourable effects on humans, but some companies are selling such devices online, leading to calls to regulate the technology. If used in the wrong way, these devices could be harmful. We need to know how long to stimulate, at what time to stimulate and what intensity to use. Electrical stimulation is used in a controlled environment for no more than ten minutes at a time and only on participants who have passed strict medical checks. Scientists are, after all, applying electrodes to the brain, which they say could have some unintended results. For example, different brain regions than those intended might be affected and, in some instances, stimulation could impair rather than improve function if the polarity of the stimulation is reversed. What is even more worrisome is that people are increasingly making DIY brain stimulation kits themselves. This puts the technology in the realms of clever teenagers. Another concern is that the science behind these devices is not ready for the commercial market, and companies are jumping on the hype of research that is not quite ready for the world. Any device with medical claims that it is meant to affect the biological function should be appropriately regulated. Suggestions of increased attention and alleviation of certain medical conditions mean that interest in electrical stimulation is bound to increase, but if the research continues to show promising results, it is clear that electric brain stimulation will need to be treated with some caution.